Our series, My Favorite Resource, features interviews with our ADR friends across the country to learn about their favorite resource. This month, Resource Center Director Nicole Wilmet spoke with Tracy Johnson, Executive Director at the Georgia Office of Dispute Resolution, to learn about her favorite resource. NW: What is your favorite ADR resource? TJ: While I utilize many resources – including RSI as one of my go-to favorites, I have found my relationships with Georgia’s court professionals through the Georgia Council of Court of Court Administrators and my network of colleagues across the nation through the National Association of Court Management to be valuable sources of information and knowledge. NW: Can you share an example of when you turned to your network for support? TJ: Building relationships with court professionals has afforded me the opportunity to see what others are doing, identify potential resources, and help in the implementation of new initiatives. At the most recent NACM conference, I attended a number of sessions on Online Dispute Resolution. I was then able to talk to some of those court administrators of the mentioned programs to get a better sense of successes and challenges and how that might translate for Georgia courts. NW: In what ways have you found that your network has been better able to serve your needs than a traditional print resource? TJ: Printed materials are a great resource, but are somewhat limited. My network of court administrators allows me the benefit of picking up the phone and calling my friend in another state to ask specific questions about his/her program. It allows me to build and develop relationships that aid in collaborative efforts. NW: What do you value most about the input you receive from your network? TJ: Relationships with court professionals and the benefit of “rubber meets the road” approach to education. The educational programming of these organizations has a practical application component. NW: How did you develop your network and what recommendations do you have for someone looking to develop their network? TJ: Attend the conferences – a must for any court professional. If you have a favorite resource you would like to share in an upcoming edition of our newsletter and on our blog, please reach out to our Resource Center Director and Court ADR Connection Editor, Nicole Wilmet at nwilmet@aboutrsi.org! Our series, My Favorite Resource, features interviews with our ADR friends across the country to learn about their favorite resource. This month, Resource Center Director Nicole Wilmet spoke with Tom Valenti, an experienced dispute resolution professional and founder of Valenti Law, to learn about his favorite resource. TV: The resource that I have found most useful over the years is Kluwer Mediation Blog. Kluwer Mediation Blog is a comprehensive source of international articles. It publishes interesting articles from leading practitioners worldwide. Its database of articles is searchable, which makes it an excellent resource. TV: As someone who keeps in touch with ADR issues internationally, I find it to be the best resource for me. I set up my account to send me an email when a new article is posted. The articles are published by leading practitioners. This is the beauty of Kluwer. It curates who can publish there, so you are reading reliable and interesting articles. I have found most of them worth reading, saving and cataloging. NW: How did you first learn about this resource? TV: As one who uses online research tools, I found the blog through a search engine, and then subscribed after finding it to be of high quality. As it turns out, I know many of the authors now, who are amongst those I look to in our field. For those who subscribe to my newsletters, there is usually an article from Kluwer in them. NW: For those unfamiliar with this resource, what is one part of this resource that you wouldn’t want someone to miss. TV: The blog has very useful searching and browsing functions, so if you are looking for something specific, you can browse by category, jurisdiction, date, author, etc., or you can use the general search feature. If you have a favorite resource that you would like to share in an upcoming edition of our blog or newsletter, please reach out to our Resource Center Director Nicole Wilmet at nwilmet@aboutrsi.org. Our series, My Favorite Resource, features interviews with our court ADR friends across the country to learn about their favorite resource. This month, Resource Center Director Nicole Wilmet spoke with Sally Campbell, Dispute Resolution Services Manager for the Supreme Court of Virginia, to learn about her favorite resource. SC: Aside from RSI, always a favorite resource, my favorite ADR resource tends to be what is helping me most at the moment. 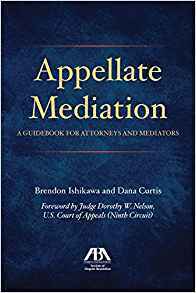 Appellate Mediation: A Guidebook for Attorneys and Mediators, an ABA publication written by experienced appellate mediators Brendon Ishikawa and Dana Curtis, tops my list right now. SC: Appellate Mediation contains a wealth of information for any mediator, whether newly minted or appellate veteran. I still marvel at this book’s promotion of a facilitative process with a client-centered, problem-solving approach – not what I expected when I first opened it. The book divides into five sections. The first, “Fundamentals of Appeals,” tackles appellate law basics, case evaluation, and decision tree risk analysis for case evaluation. The second, “The Appellate Mediation Process,” covers each phase of the mediation, with headings varying from “Explanation of the roles of the Mediator and Participants” and “People Get Angry; It’s Okay,” to “Brainstorm for as Many Options as Possible – Especially Options with Asymmetric Gains.” The “Practice Tips for Appellate Attorneys” section focuses on preparing attorneys and clients for mediation; strategies for the sessions; and crafting an enforceable agreement. “Practice Tips for Appellate Mediators” delivers excellent, detailed guidance for mediators. Finally, the Appendix packs a punch with great resources for appellate mediators, like sample phone call dialogue and sample documents. Appellate Mediation is eminently accessible with a user-friendly design that makes it easy to find specific information. The authors even include a chapter on mediator professional development. That chapter’s attention to the reflective practice process generated an a-ha! moment, and facilitated our goal to design the Mediator Self-Reflection Treasury to guide and support mediators even in solitary, first-time self-reflection. SC: In 2018, the Supreme Court of Virginia approved appellate mediation pilot projects to run for two years in the Supreme Court and the Court of Appeals of Virginia. I found this book while looking for resources to assist in the training of appellate mediators. It fit the bill so well that the trainer used it in the basic mediation course. SC: For newer, non-appellate mediators, I would recommend Chapter 14 (“Phase 2, Information Exchange, and Phase 3, Identifying and Organizing the Issues”), although there is so much to be gleaned elsewhere in the book, I wouldn’t stop there. For seasoned mediators, I’d recommend Chapters 2 and 3, that address case evaluation as in “What is my best presently available option?” and case valuation through decision tree analysis. In this well-written, accessible book, these chapter materials aren’t nearly as daunting as they sound. This book might top my list for a long time to come. If you have a favorite resource you would like to share in an upcoming edition of our newsletter and our blog, please reach out to our Resource Center Director Nicole Wilmet at nwilmet@aboutrsi.org. Our series, My Favorite Resource, features interviews with our court ADR friends across the country to learn about their favorite resource. This month, Resource Center Director Nicole Wilmet spoke with Peter Salem, Executive Director of the Association of Family and Conciliation Courts to learn about his favorite resource. PS: My favorite ADR resources are my phone and computer, because they contain the contacts for the network that I have developed over the last 30+ years. There are a lot of great blogs, websites, journals, and other print and electronic resources out there, but knowing who to ask often helps me uncover valuable nuggets that I would not have otherwise known about. NW: How did you develop your network and what recommendations do you have for anyone looking to develop their own network? PS: My father preceded me in the field and introduced me to many of his colleagues, so I had a head start. But I also learned from him and expanded my circle. I attended conferences, asked questions, used the telephone instead of email (full disclosure: email did not exist when I started), developed project ideas, and asked for advice and help. I volunteered for everything; newsletters, committees, boards, and conference planning. After a while, I started teaching and training. That’s a lot of extra work on top of a full-time job, and a lot of the money came out of my pocket, but it gave me the opportunity to invite others to teach, write, or work on projects, and they typically said yes. Because I was often part of the planning group, I was invited to the small dinners, etc., when the rock star ADR people came to Wisconsin. I would later see them at national conferences and we would already have a connection, and everything flowed from there. I didn’t plan this, of course. I just took on interesting projects with people I liked. So I guess my recommendation for others looking to establish a network is get involved and do interesting things with interesting people. Start small and locally, and do an amazing job. People notice great work, mediocre work and especially work that is not completed. PS: I use my network to help solve problems and answer questions, and for me that is an iterative process. Websites and journal articles provide valuable information, but they are just a starting point, not something to be taken at face value. We are in a field that advises people to dig beneath the surface and look at underlying issues. Why wouldn’t I follow that advice when working on my own stuff? PS: As the executive director of a 5,300-member organization, I frequently get requests for information or referrals that I can’t answer myself. But I have access to a lot of experts and can easily put a handful of names in an email to people with the requisite expertise. People appreciate any answer and are even more excited to get a response from a leading ADR author, researcher or practitioner. Similarly, there are some great listservs out there that serve the same function, albeit in a less targeted fashion. For example, the Bestinterests-talk list is an independent list run by an AFCC member for people in family law/dispute resolution. There is an amazing exchange of information and ideas. PS: The input from my network is always thoughtful, honest, and it comes from experienced professionals with a very high level of expertise. That is invaluable. But what I value even more is that my network exemplifies the incredible generosity of dispute resolution professionals. Throughout my career, leaders in the field have been willing to take the time and effort to help me learn and grow. And to paraphrase my good friend Susan Yates (a long-time member of my network), now that I am more senior in the field, I hope that I am following in their footsteps. If you have a favorite resource you would like to share, please reach out to Resource Center Director and Court ADR Connection Editor, Nicole Wilmet at nwilmet@aboutrsi.org!